CarGurus has 16,190 nationwide Q5 listings starting at $6,495. A bit more ambitious than your usual mid-cycle refresh, Audi really got its hands dirty for the 2013 Q5. It replaced the V6 upgrade option, expanded the lineup with a Hybrid (reviewed separately) and announced a turbodiesel for the next model year above and beyond the cosmetic touch-ups a refresh at this point usually entails. Unfortunately, that means the disappointing news of the SQ5 not making it over the pond is completely confirmed, but the engine slated for release in the 2014 model year could very well sate that craving if the new and improved V6 doesn't fit your bill. 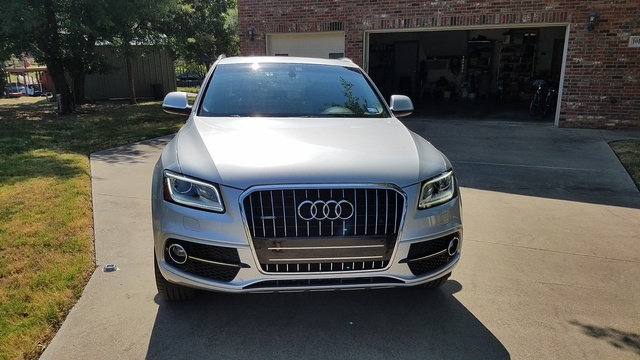 Like the 2012, the 2013 Q5 still offers a turbocharged 2-liter inline 4-cylinder in its 2.0T Quattro baseline, and unlike the European version, this engine carries over absolutely unchanged for U.S. markets, good for the very same 6.8 seconds to 60 mph with the same 211 hp and 258 lb-ft of torque at 20 mpg city/27 highway on the usual premium fuel. The other Q5 trim answers driver concerns about torque with a new engine and thus a new name. Now known as the 3.0T Quattro, the top-shelf 2013 Q5 offers 272 hp and 295 lb-ft of supercharged torque, as opposed to the 2012's 270 hp and 243 lb-ft of naturally aspirated torque, which actually put it slower than the 2.0T at the time, and closer to the typical fuel economy for standard all-wheel drive at 18/23. There are no revised efficiency figures for the new supercharged engine just yet, but there's no reason to expect it to be any worse than the outgoing model. If fuel economy is a genuine concern, then check out the new Hybrid—either way you're getting AWD, a stellar suspension, some 4,400 pounds of towing capacity when properly equipped and an 8-speed automatic transmission. The only real downside is the Hybrid's battery taking up some of the already-cramped 57 cubic feet of cargo space, but that being the case, the 2014 diesel offers 245 hp, 428 lb-ft of torque and allegedly class-leading fuel efficiency for a pure internal combustion engine. It's touted as one of the smoothest and quietest diesels on the market, and though the SQ5 won't make it to the States, perhaps a detuned version of its engine will be sufficient to prove to Audi we like our performance diesels. Hint, hint. Otherwise the 2013 Q5 is pretty much the 2012 Q5, just with more power and new LED lights, grille and bumpers. The 2.0T is offered in Premium and Premium Plus levels, while the new 3.0T affords Premium Plus and Prestige feature sets. 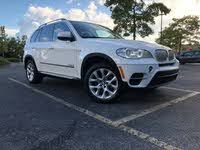 With the sunroof recall out of the way for 2012, that leaves very few excuses not to put this car-like performance crossover on your list. The cabin is repeatedly praised for its elbow room, even when housing a full complement of 5, most likely because the rear seats slide and recline to provide room just where you need it. However, drivers note Audi missed a few details—namely a tailgate that doesn't stop before possibly hurting someone and tailpipes that stick out too far, potentially causing burns if you're not paying attention. 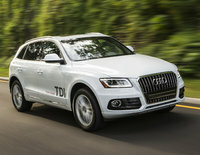 What's your take on the 2013 Audi Q5? Users ranked 2013 Audi Q5 against other cars which they drove/owned. Each ranking was based on 9 categories. Here is the summary of top rankings. Have you driven a 2013 Audi Q5? HI, My 2013 Audi Q5 started blowing out hot air. Any ideas on what the problem could be? Is it possible to add back up sensors to a 2013 Q5 from Audi parts and not an aftermarket product?